War has ravaged Chicago. It is nothing but a shell of the city it once was. To protect themselves from whatever may lie outside (we are not yet provided this information), a wall was built around the city. To prevent further wars, the citizens are divided into 5 factions: Erudite – the intellectuals; Abnegation – the selfless, who also run the current government; Candor – who always tell the truth; Amity – the farmers; and Dauntless – the fearless protectors. Around the age of 16, all children are given an aptitude test that determines which faction they best fit in. At the choosing ceremony, each candidate has a choice. They can remain part of the faction they were born into (most of the aptitude tests reveal that this is where the children belong) or they can choose to join whichever faction they want to be a part of. One of the underlying beliefs of the society is faction before blood. This makes the choice that much more important. Those who do not fit into a faction roam the city as lowly, homeless citizens. A burden to society. They are looked down upon by all the factions. Rarely, a candidate’s aptitude test will show that they fit into many of the factions. These people are known as Divergent. They don’t fit into a specific role in the society. Since they process things differently than those who do truly belong to one faction, they cannot be controlled and are considered dangerous. These Divergents are hunted and executed. Beatrice “Tris” Prior (Shailene Woodley) is the daughter of two prominent members of Abnegation, Natalie (Ashley Judd) and Andrew (Tony Goldwin). Andrew works directly for the leader, Marcus (Ray Stevenson). Beatrice and her brother, Caleb (Ansel Elgort). are up for the choosing ceremony at the same time. To their parents’ dismay, both choose new factions. Tris, as Beatrice is now known, has joined the exciting, fearless Dauntless faction. The training and initiation are brutal. This is to make sure they are fit to be members of the factions. Those who perform lowest will be cast out, forced to join the factionless. As one of the weakest of the transfers (those who choose a new faction), Tris struggles to get off the bottom of the list, but is more determined than anyone. When Tris feels something is off, and discovers a deadly plot in the works, she must find a way to stop it. She must also protect herself before anyone discovers the secret she has been keeping. 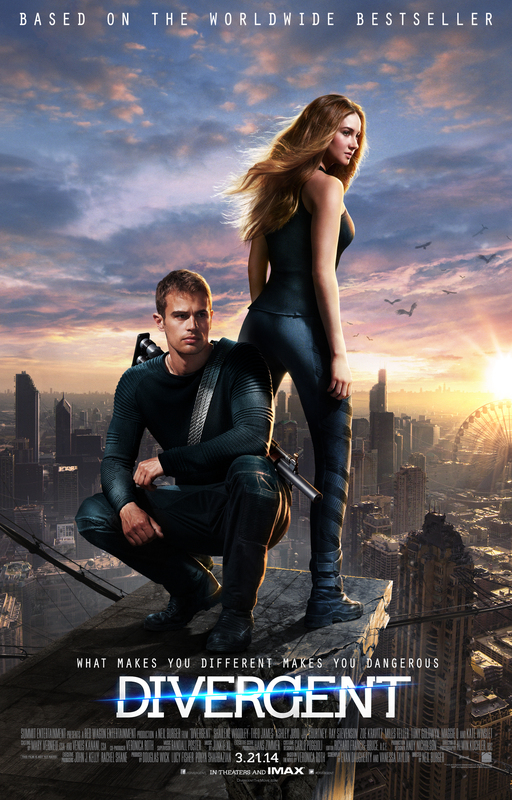 Divergent is a movie based on the young adult novels of the same name by Veronica Roth. It is very obviously gunning for the same audience that is already wrapped up in The Hunger Games franchise. Set in a dystopian, war-torn future, life is strictly regimented. For everyone’s safety, of course. Kate Winslet, who leads the Erudite faction, is ruthless and looks to logic to further society. She really doesn’t have much to do for most of the movie. A passing comment here and there. It isn’t until the climax of the film that she really makes herself know. She isn’t really given a chance to do much for the film. The same can be said for Mekhi Phifer. Only, he isn’t even granted the opportunity for much action even at the end. A bit of a waste for these two. The film focuses mainly on Shailene Woodley and her group of friends, or not-so-friendly transfers, including Zoë Kravitz, Miles Teller, and Theo James, as Four, one of the higher ranking trainers in Dauntless. This group is really tailored to the target audience. They are good-looking, young, exactly what you expect in this type of movie. Miles Teller, while not given as large a role as he could fill, spends his time on screen antagonizing Tris with the sarcastic edge that makes him so entertaining. Theo James is there for eye candy, with his brooding looks. The real standout here is the incredibly talented Shailene Woodley. She may not come across as the type who may lead a rebellion, she has a confidence, and likeability, that is reminiscent of Jennifer Lawrence in The Hunger Games. Shailene acts circles around everyone else in the film. The range of emotions she can display is impressive. Not even Kate Winslet is up to her level. There have been countless ravaged cities shown in movies throughout the years. Divergent doesn’t stray too far from the formula for this landscape. That’s not to say it isn’t well done. The story does have its flaws. At times, it seems to be trying to figure out where it is going, or maybe trying to fit too much in (contributing to its 2:19 run time). As with almost all young adult movies, there is a certain cheesiness to it. Especially what attempts to be a tagline/summation of the series at the end. None of that really detracts too much from the movie, though. Overall, the story is presented in a relatively fast-paced, decently put together fashion. Will Divergent topple The Hunger Games from its throne? Unlikely. It is, however, probably one of the best contenders in the young adult genre.